Saved from the Titanic was the first film about the story of the Titanic, released on May 14, 1912 (only 29 days after the sinking of the ship). 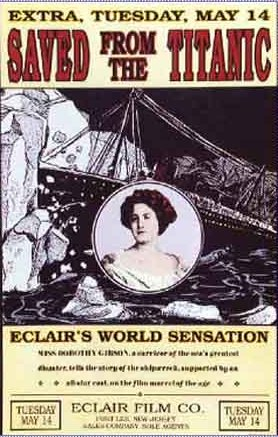 This film is unique among the Titanic adaptations is that it starred an actual Titanic survivor (actress Dorothy Gibson) who wore the same outfit she wore on the ship. Upon returning to New York, she co-wrote the script and played a fictionalized version of herself for the film. The plot involves her recounting the story of the disaster to her fictional parents and fiancé of her experiences as a passenger during the disaster. The story was mostly synced to footage of Titanic's sister RMS Olympic and stock footage of icebergs. The short film is only 10 minutes in length and was filmed in less than a week. The movie was successful on both sides of the Atlantic, though many criticized it for commercializing the tragedy too soon. It may have contained a scene in an early natural color process called "Kinemacolor" making it one of the earliest narrative films in color. The movie is also notable as being the final film that Dorothy Gibson featured in before she suffered a mental breakdown, possibly due to the strain of having to relive the experience of the Titanic's sinking. The last known prints of the movie were destroyed in a fire at Eclair Studios in March 1914. All that remains of the film are a few stills published in the Moving Picture News and Motion Picture World showing scenes of the family and a still of Gibson standing in front of a map of the North Atlantic pointing to the location of the Titanic. The loss of the film has been described by some film historians as one of the greatest losses of the silent era. A print was believed to have been found in Germany in 1998, but it turned out to be a print of the 1912 German Titanic film In Nacht and Eis. IMDb trivia page on the film. Retrieved 28 Aug '13. The film's Wikipedia entry. Retrieved 28 Aug '13. ↑ 2012 ibtimes.com article on the film. Retrieved 28 Aug '13.